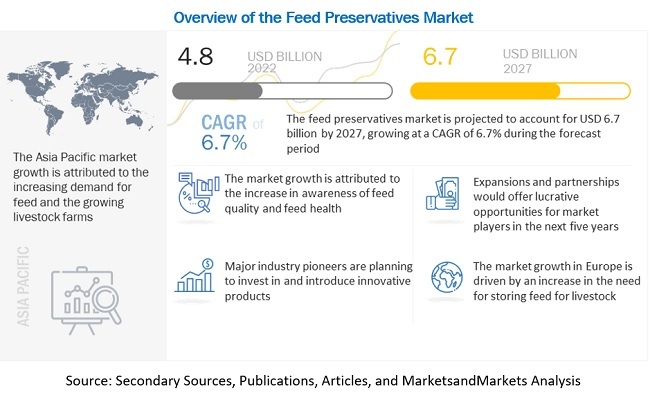 The feed preservatives market is projected to reach USD 3.57 Billion by 2022, at a CAGR of 9.2% from 2016 to 2022 due to the increasing demand for quality feed. This growth is largely fueled by the increasing meat consumption and rising concerns regarding its quality and safety. 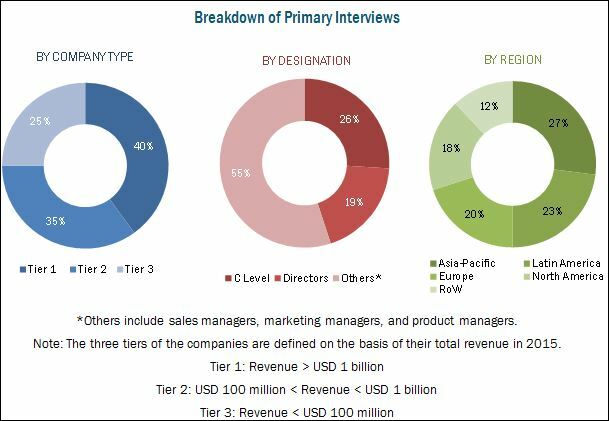 The research methodology used to estimate and forecast the feed preservatives market starts with capturing data on key players and their revenues through secondary sources such as annual reports, Factiva, and Bloomberg. The overall market size of feed preservatives was arrived at using the bottom-up procedure from its usage in different types of livestock feed which was validated through primary interviews and secondary research. Following this, a top-down procedure was employed to estimate the sizes of other subsegments based on ingredients and type of feed from the total market, which were then verified through primary research by conducting extensive interviews with key people such as CEOs, VPs, directors, and executives. Data triangulation and market breakdown procedures were employed to complete the overall market engineering process and arrive at the exact statistics for all the segments and subsegments. The feed preservatives ecosystem comprises feed premix and additive manufacturers such as Kemin Industries, Inc. (U.S.), Nutreco N.V. (Netherlands), Impextraco NV (Belgium), and Biomin Holding GmbH (Austria) among others; specialty chemical manufacturers such as Perstorp Holding AB (Sweden) among others; animal nutrition & health companies such as Novus International, Inc. (U.S.), Merck Animal Health (U.S.), Alltech, Inc. (U.S.), BASF Animal Nutrition (Germany), and Dupont Nutrition & Health (U.S.) among others; and feed manufacturers such as Cargill, Incorporated (U.S.) and ADM Co. (U.S.) among others. The feed preservatives market is projected to grow at a CAGR of 9.2% from 2016, to reach USD 3.57 Billion by 2022. The growing awareness about customized formulations and feed management practices to reduce production costs and improve livestock health increased the investments on nutrient-rich and high quality feed products and thereby developed the need for feed additives such as acidifiers, mold inhibitors, and anticaking agents to maintain the feed quality. The feed acidifiers segment is projected to be the fastest-growing segment in the feed preservatives market from 2016 to 2022, due to its multi-functional role as an antimicrobial, gut health promoter, and acidity regulator. The growing demand for cost-effective acidifiers in the swine and poultry sectors is expected to play an important role in shaping the market in the next few years. The poultry segment accounted for the larger market share in feed preservatives in 2015, due to the increasing growth of the poultry industry as an organized sector in Asia-Pacific and Latin American regions. With the increasing usage of feed additives and supplements to improve livestock productivity, the demand for acidifiers is also projected to gain strong growth especially, among mono-gastric species such as poultry and swine. The usage of feed preservatives in compound feed has been prominent due to its effectiveness to sustain feed quality during transportation and silo storage. With increasing competition, raw material price fluctuations, and regulatory requirements, the effective application of preservatives in the feed has been of prior importance for the feed manufacturers. The European region was the largest market of feed preservatives in 2015, whereas Asia-Pacific region is projected to be the fastest-growing market for feed preservatives from 2016 to 2022. In Europe, strict regulatory restrictions on antibiotics and increasing popularity for feed acidifiers as a suitable alternative were important reasons for its large market share in 2015. In the Asia-Pacific region, the shift towards organized farming in poultry and aquaculture sectors in emerging markets such as India, China, Vietnam, Indonesia, Malaysia, and Thailand has been a boost for the growth of the market. However, the decline in global prices of farm end-products can lead to significant cost-cutting measures on the production front which is witnessed to be a limiting factor for the growth of the market. According to MarketsandMarkets, key players such as Kemin Industries, Inc. (U.S.), Novus International, Inc. (U.S.), Alltech, Inc. (U.S.), Nutreco N.V. (Netherlands), Cargill, Incorporated (U.S.), BASF SE (Germany), and Biomin Holding GmbH (Austria) have been implementing different strategies to achieve growth and development in the global feed preservatives market. Expansion and mergers & acquisitions were considered to be the most profitable strategy among key players in the last five years, which eventually is projected to bring about market consolidation at the global level.